We are dedicated to contribute to a better and safer future through our business activities and investment strategies. Walking in the footsteps of our parent company, a recognized leader within this area, we invest according to the BNP Paribas Asset Management’s Responsible Investor Policy. Our commitment at Alfred Berg can be summarized in the following three activities: applying ESG criteria to investment processes; exercising our shareholder voting rights; developing and promoting SRI products. 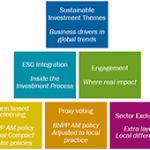 ESG is criteria or standards regarding environmental issues, social issues and corporate governance. Learn how we work with the different aspects of SRI.